CPT is assisting Dog Star Technologies in researching the anxiety reduction properties of several existing canine apparel products and concepts. 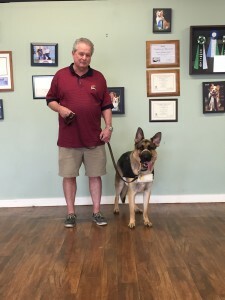 Concepts that Dog Star wishes to study include the benefits and/or detriments of loose garments versus compression garments and the benefits and/or detriments of thermally controlled garments and weighted garments. A frontal view of Ike wearing a loose-fitting weighted vest during a CPT behavior modification lesson. Dog Star is testing the effects of the garments on dogs that exhibit a variety of anxiety or fear-based disorders or behaviors, including general anxiety disorder, separation anxiety, neophobia (fear of novel objects or environments), phonophobia (fear of loud sound), brontophobia/astraphobia (fear of thunderstorms), dog-human state anxiety, dog-dog state anxiety, dog-human aggression, and dog-dog aggression. CPT will assist Dog Star by integrating the vests when working with private or in-home private clients whose dogs exhibit relevant behavioral symptoms. CPT will then collect anecdotal data and empirical data that Dog Star will use to formally study the benefits of a particular canine apparel product, the categorical applications in which the product is most or least indicated, and the profile of dog in which the apparel product is most or least effective. The project spawned when The Dog Project used a popular canine compression garment to hold a respirometer while completing MRI trials for two dogs. The Office of Naval Research requested that the Project team compile respiratory and sniff data while the dogs were engaged in a specific olfactory neuroscience experiment. However, the two dogs, who had historically succeeded during MRI tests, became very anxious when wearing the compression garment. Although the garment was touted by the manufacturer as an anxiety reduction garment, the vest blatantly had the opposite effect on these two normally very composed animals. In Ike’s case the vest had salient benefits. Whereas Ike was noticeably reactive during his first appointment, in which he did not wear an apparel product, while wearing the vest Ike remained conspicuously calm and could be brought very close to the volunteer dog without exhibiting an aggressive response. The Dog Project team surmised that the tightness of the garment was uncomfortable to the two dogs. In addition, the fabric failed to breath well, which uncomfortably raised the body temperature of the dogs, despite the air conditioning and internal fans operating within the MRI room. 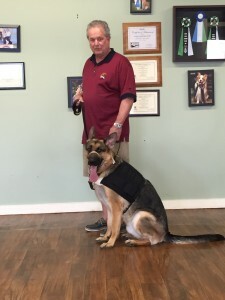 Consequently, Dog Star Technologies started a study to test a number of canine vest product concepts and options to determine which garments work and when they are most applicable. 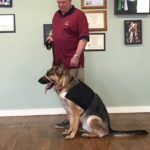 To assist Dog Star in the endeavor, in some cases, CPT will integrate the vests during a private or in-home private lesson. In other cases, CPT will loan the vests to a client for a 7-day period, during which the client will be responsible for collecting empirical data and completing a questionnaire. CPT clients with anxious dogs can request participation in the study by contacting Mark Spivak by email (MarkCPT@aol.com).